Since the dawn of mankind, the existence of supernatural has confounded humans more than anything. 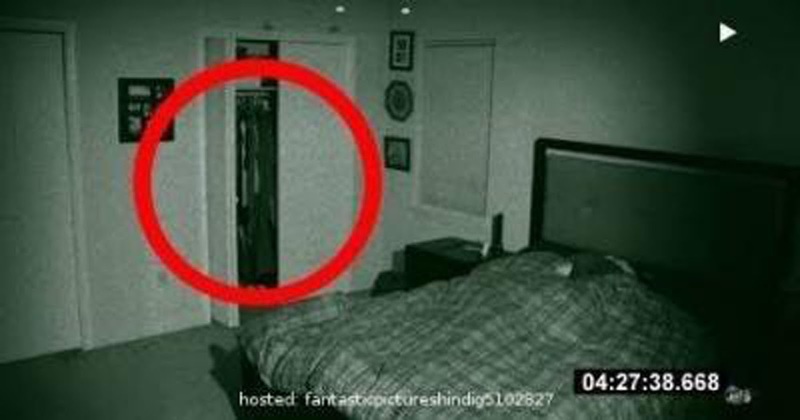 Ghosts, poltergeists, jinns, a woman in white and many more. Though there are some who say that there is no place for such primitive beliefs in our modern day society, still we sometimes can not comprehend some happenings, happening that leave us baffled. These happenings, they push us to believe that we might be wrong, and there might be such things which can be termed as 'Supernatural'. As you can see, the man sets the camera at 1:45 am. Then the man turns the night vision ON, so that the movements in dark can be captured. After he was pleased with the camera, he got into his bed with his mate. At 4:27 in the morning, the cabinet door opens, on its own. 6. Keep Your Eyes On The Lamp! Almost seconds after the door opened, the lamp knocked itself off the desk! Keep your eyes fixed on the side of the man, and yes, you just saw that!!! In case you didn't see what was fishy in the gif. 9. Where Did It GO?! And after few micro seconds, the entity vanished! Check out the entire video if you want to get even more spooked!